The Magellan Region of Chile comprises the cities of Punta Arenas, Puerto Natales and the most scenic if not the most beautiful national park in the country: Torres del Paine, that is the main attraction in the area. Delimited by the Magellan Strait to the South and Torres del Paine to the North, the region lays between channels, fjords and mountains. g to Torres del Paine UNESCO’s Biosphere Reserve is nothing less than a complete surprise, the dark horns’ peaks of the granite range are visible from the entrance and they welcome the traveler to a world of turquoise lagoons, hanging glaciers and marvelous valleys where trek options are infinite. We may describe the weather in the Magellan Region as moderate rainy cold. 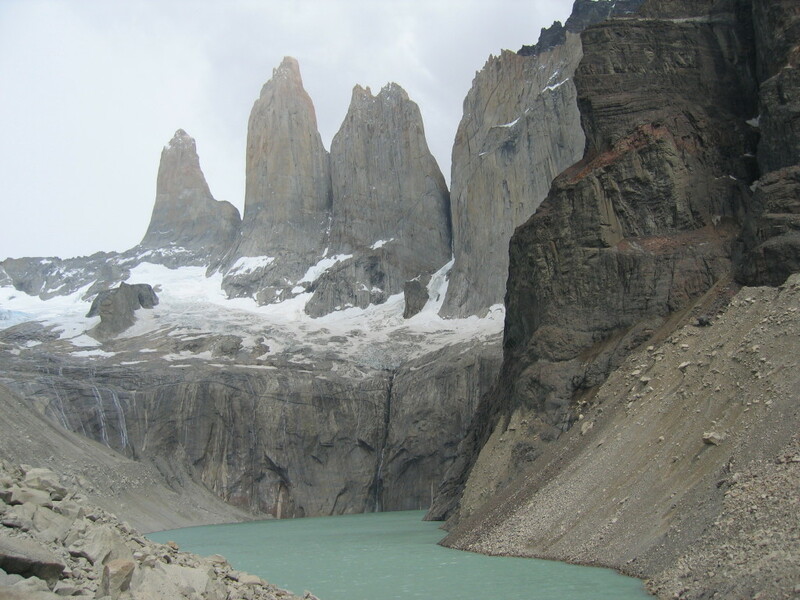 However, Torres del Paine area is changeable and unpredictable due to the microclimate, typical of the park. Even in summer, rainfall can surprise you while trekking during the brightest day. Windy days are common, especially in the warmest months. The average temperature is 11 Celsius during the warm months and 3 Celsius during winter. One night in Punta Arenas is recommended for those taking a morning bus or flight, two nights in Puerto Natales if you are planning to take a day visit to Torres del Paine. If you are thinking of trekking, you must stay in any hotel, B&B/Inn, hut or lodge in the Park, at least two night for a day excursion. For those willing to walk “the W” we recommend staying 3 or 4 nights depending on the chosen type of accommodation. The only airport available is located in Punta Arenas, 250km (155 miles) south of Puerto Natales, it receives flights from Puerto Montt (2h 10m), Santiago de Chile (3h 20m) and Ushuaia. By land Punta Arenas can be reached from Ushuaia (12h) and Puerto Natales (2 to 3h). Puerto Natales can be accessed by from Punta Arenas and El Calafate (7h). There are two options to get to Torres del Paine: by land from Puerto Natales (2h) and El Calafate (5h); by boat from Puerto Natales (full day excursion). Finally, Punta Arenas and Puerto Natales can be accessed by boat from Ushuaia and Puerto Montt aboard the Mare Australis and the Navimag, respectively. Leaving heavy equipment behind in Las Torres camping area, walk NW from the Refugio passing the Campamento (Camp Site) Chileno and to the W to a small lake just below the Torres del Paine, where there is probably the most amazing view within the park – of the three towers of Paine, mirrored in the lake. Retreat to the Refugio and take your equipment left there. Today, you will trek by the lake which is narrow with lots of shrub on the edges including the wild barberry (Berberis Buxifolia or Calafate – the edible red/pink/magenta berries with a bittersweet taste when ripe) which makes wearing shorts unpleasant. You will arrive to Campamento Cuernos, where you’ll spend the second night. Early morning departure to Campamento Italiano. With a daypack only, walk N to the Campamento Britanico and further N or NE for a view of the valley. If you climb high enough towards an apparent pass to the NE (no clear path, you start walking on swampy grass and continue on unsteady rocks and in high wind, not very pleasant, but we met several people going there), you can see the Torres del Paine from ‘behind’. Retreat to the Campamento Italiano and sleep there. 2-hour trek to Refugio Pehoe. From Refugio Pehoe walk by the Lago Grey to the Campamento Grey. The camping ground is close to a nice sandy beach, although few would want to swim between the ice rocks. North walk for a closer look of the glaciar Grey. In the morning, you’ll embark on the vessel for navigation across the Grey Lake. Once on the shore, transfer back to El Calafate or Puerto Natales. Grey Glacier is the biggest of all those that can be visited by means of a regular tour in the park. At present this natural marvel of impressive dimensions – which constitutes the end of the Southern Ice Field – can be visited and admired in all its magnitude sailing through the lake on board of our vessel Grey II. Weighing anchor from Hosteria Lago Grey and after sailing for 35 minutes among many icebergs, whose shape and color offer us unique themes for our pictures and video shots, we will approach the glacier’s front wall, which is divided in two by a central island where landing is allowed. Here it is possible to appreciate in their entire dimension the infinity of crevasses and risings that constitute the snowdrift that gets lost in the distance. There are some periods in which big collapses in the front of the glacier fills the lake with icebergs of different sizes; the density of this mass of floating ice turns impossible the navigation of our vessel Grey II being then suggested the sailing in an inflatable around these masses of ice afloat not far from the Hostel. Drive out of Puerto Natales along the Seno de Ultima Esperanza (Last Hope Sound) to Milodón Cave, the cavern, about 90 feet high, 200 feet deep, in which Captain Hermann Eberhard found in 1896 the remains of a prehistoric animal (which he named Milodón). You will continue on through the hills and extended pampas of the beautiful and beautifully diverse Patagonian landscape. Next, enter the spectacular Torres del Paine National Park, which is part of the United Nation’s World Biosphere Reserve system. Here, pumas, foxes, guanacos and rhea coexist in what is nothing if not Patagonian Eden, a rich landscape of Lengas and Coigües, fragrant heather, legendary Calafate (it is believed that those who sample this regional berry always return) and other amazing flora. Watch as the emerald Nordenskjold Lake at the base of the mountains pours through roaring Salto Grande (Grand Waterfall) into Pehoé Lake, a grand lake in its own right and a great spot to study the Cuernos del Paine (Horns of Pain). Drive along the bank of the lake to Salto Chico (Little Waterfall); stroll through an old lenga forest; enjoy an optional picnic watching giant chunks of ice, pieces of the nearby Grey Glacier, drift along the Grey Lake. For the return, cross Amarga Lagoon for yet another breathtaking view of the park’s iconographic Torres del Paine. Return to Puerto Natales.